Italia Ruotolo was born in Naples, Italy. After Classic Literature studies she graduated at the Fine Arts Academy of Naples. For many years she worked as goldsmith and jewels designer. 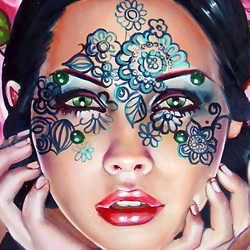 Ruotolo's work is a broad range of pop art and art nouveau. Her source of inspiration is the world that surrounds her. In her work, there isn’t much distinction between high and low cultural level, because she’s aware that the contemporary man lives in a myriad of sensorial stimulation and is himself the product of continuing interlocution between the real and the mere appearance or mere fiction. We find echoes of these contradictions in her work in constant search of a balance between past and future, good and evil,darkness and light .